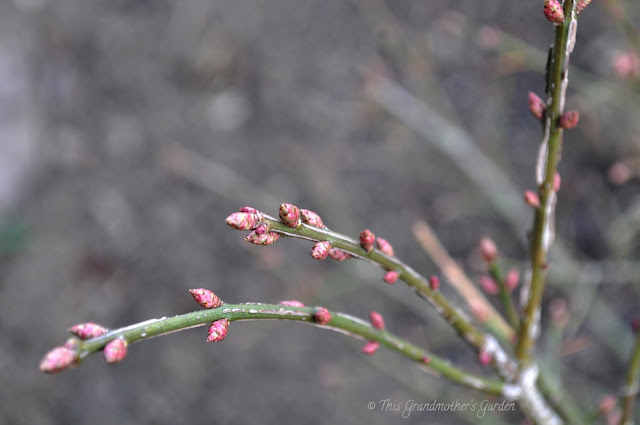 This Grandmother's Garden: My Buds are Bursting! And their aroma will be deliciously intoxicating. a sure sign that Winter's attempt to linger is finally waning. Forest Pansy, Oklahoma and Eastern. 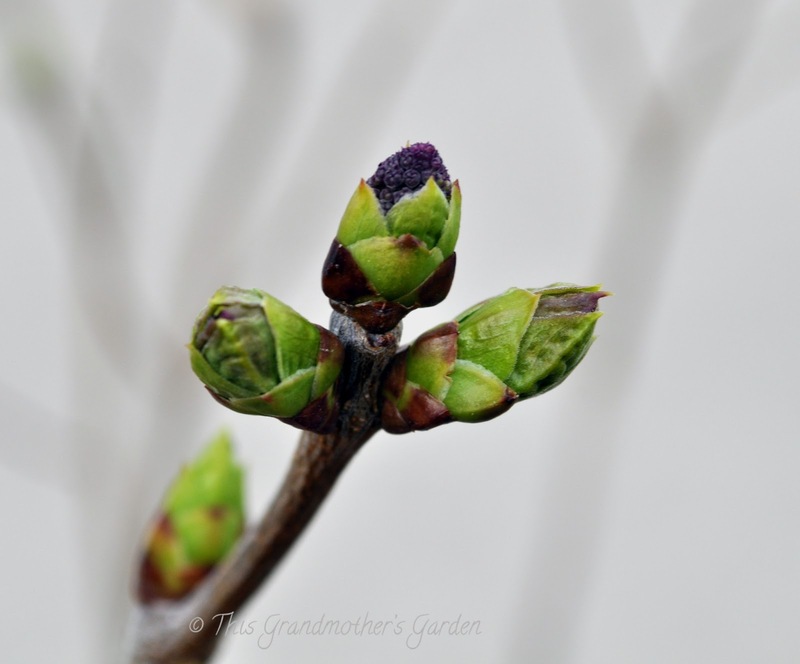 Who doesn't dream of sweet lilacs in Winter? 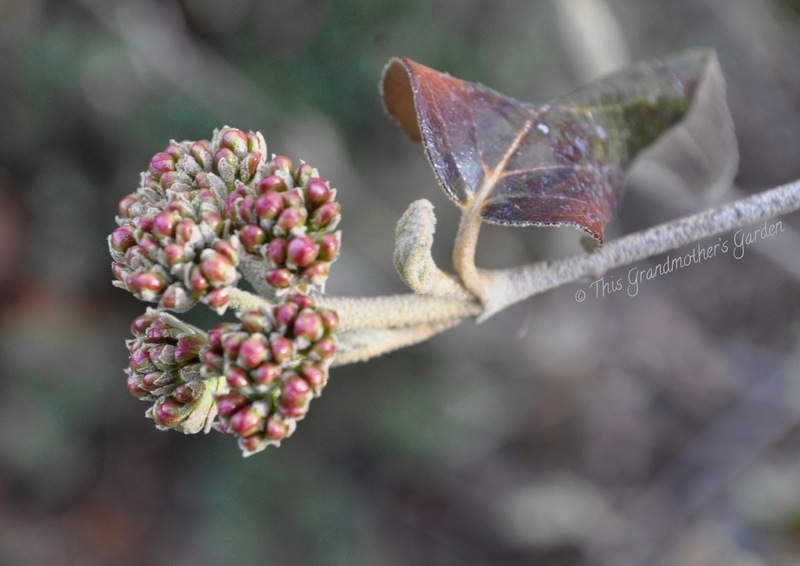 these buds will be blooming soon. The aroma will be heavenly... I can hardly wait! when these tiny buds open. The periwinkle blue is a favorite color in my gardens. of one of the most gorgeous blooms of June. but the wait will be so worth it! as a source of beauty in the garden. defining the edge of a pathway. then, quite suddenly, burst into flames in Fall. do you think it's warmer there? They are the most enchanting little blooms in my gardens. in my gardens, that it is. There are two of these trees. Each about 20' tall with gray-white bark. after the blooms have disappeared. I never even notice them! It's only in Spring that this tree captures my heart. I've got to find out the name of this tree. So I search and I search... but I never find. Do you know the name of this tree? Those are really lovely photos. It's so nice to see things starting out for you. Spring is definitely bursting out in your garden! It's nice to see some swelling buds, another couple of weeks for us. I am so sure that I caught a whiff of Daphne scent, on the air yestreday, it's unmistakenable, but I have no idea who has one around here. What wonders your garden is showing you....so beautiful. Nice to see your spring arriving with lovely pictures of your budding shrubs. some of the shrubs we have here in France. 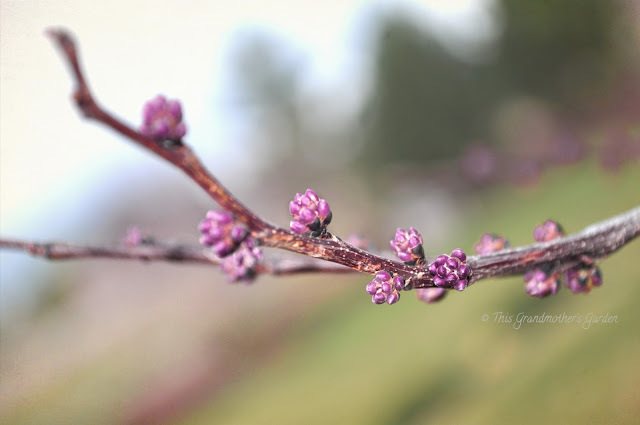 Is the Easter Redbud one to your native area ? It warms the heart to see the beautiful buds of spring, doesn't it? Great close up shots! My beds are swelling, not quite bursting just yet. Must keep an eye on this post to see if anyone names that tree - it's gorgeous. Will add it to my wishlist if I find out what it is! Don't you just love seeing those first signs of new growth. Makes me all anxious and excited. LOL! Beautiful pictures. I think your enchanting mystery trees are red maples (acer rubrum). They sure have pretty blossoms. I sure enjoy seeing the changes in your beautiful gardens. Beautiful...we had a foot of snow this week and so the garden was again delayed...we shall see what spring we get. Thanks, Cher...I enjoyed my walk gathering them! To look through the window, it seems so gray and barren in my gardens. The beauty of Spring so early is only discovered up close. Eastern Redbud is not native here but seems to do well with enough water. Actually the Oklahoma Redbud does much better in my gardens as it's leaves are glossy and retains moisture. I discovered the Oklahoma Redbud after I planted the Eastern Redbuds... it thrives in my garden while the Easterns require a bit more pampering. Wish I had more. Yes, it does... I absolutely love to see my gardens awake. They really have been asleep for such a long time. First comes the swell... then comes the burst. We're actually on hold here as it's cold and dreary again. It takes sunshine to entice those babies to bloom. 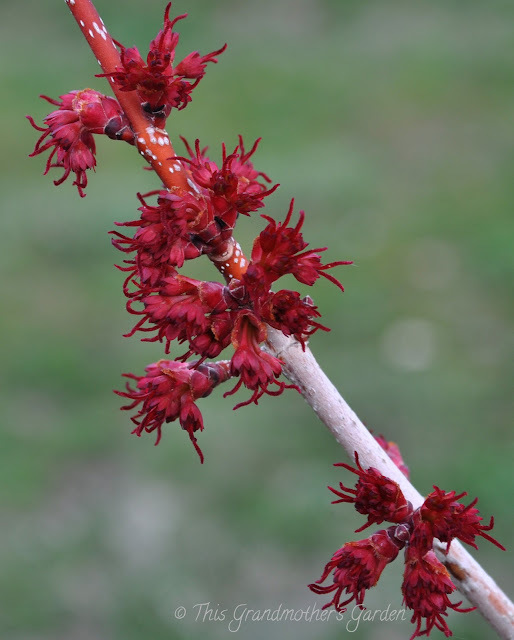 I googled acer rubrum and you are right, Ferrill! Thank you, thank you! You've solved the mystery. So happy to know this. Perhaps if I had paid closer attention to the leaves I could have discovered this on my own. But honestly, I've never even noticed the leaves up close. Red Maple... (acer rubrum) thanks to Ferrill and it IS gorgeous! It's always my fear that when Spring arrives so late, the season will be cut short and we'll go straight to Summer heat. Hope that doesn't happen. There's new snow in our mountains this morning. Stay warm Donna. This weekend seems to have been the turning point for us here in Wisconsin. 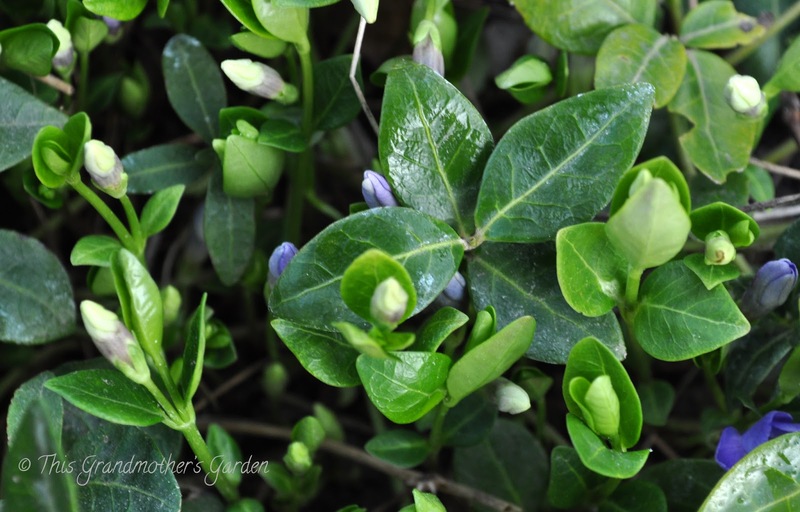 The snow is almost melted, and flowers are blooming all over the place--Snowdrops, Crocuses, Daffodils, Maple flowers, Hellebores, Hyacinths...when spring is delayed, it seems to happen all at once. I'm a huge fan of Redbud and Periwinkle, too. The native Eastern Redbud is vibrant beyond words, and the Periwinkle is the most exquisite shade of blue. 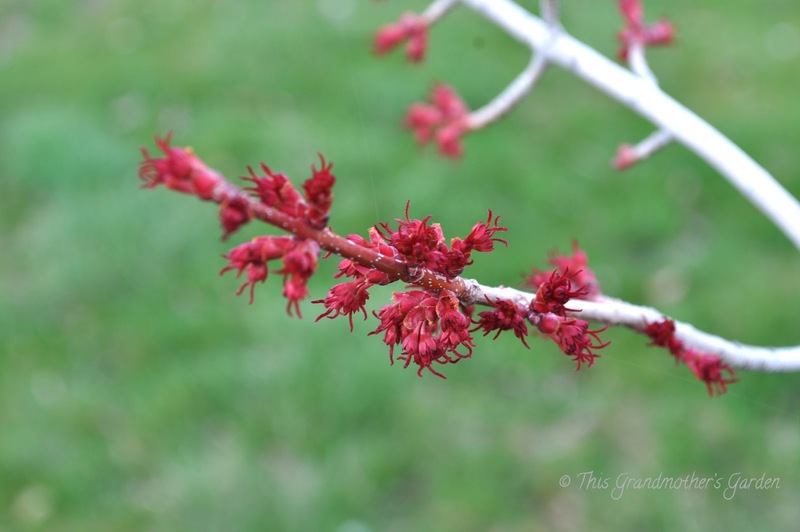 Your garden and neighborhood Red Maples are beautiful! Ohh....Unfortunately in Sweden we seem to have come into a new ice period with too much cold, sunshine and no rain at the the same time ( seven weeks in a row), not a good combination for our garden plants. The new area rug is due on the 11th so I hope it blends in .. 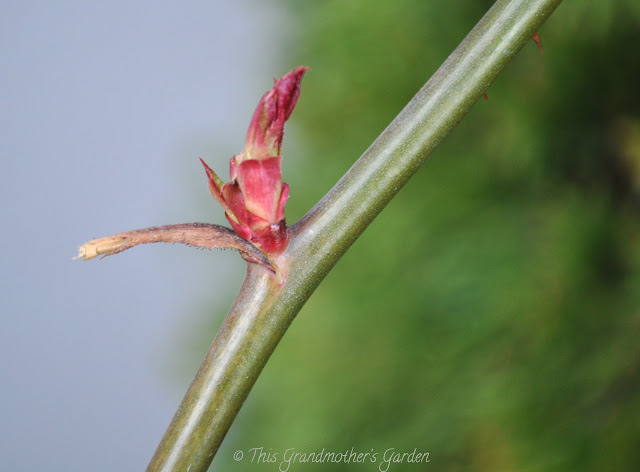 I have a corkscrew hazel in deep purple that I planted last year .. it is so striking in that colour I am in love with it of course ? haha .. these are such pretty buds .. you are ahead of us .. but we will eventually catch up !